1 - Don't start a group unless you have time to manage one. It takes work to build an engaged Facebook group, so before you start a group, be sure you have to time to do the work! 2 - Have a well-defined purpose and let members know what it is. Don't create a group simply because it's what other people in your industry are doing. Determine WHY you want a Facebook group - what value will it provide to your community, and what value will it provide to your business? 3 - Set clear guidelines. You gotta have clear rules and guidelines in order for your group to stay fun and engaging. Say "no" to spammers! 4 - Ask questions of pending members. In the group settings, you have the ability to set specific questions that people must answer prior to being approved as a group member. Take this opportunity to learn more about your community, what their pain points are, etc. TIP: The responses are NOT saved, so create a spreadsheet or other doc to save the answers before approving member requests. 5 - Be your most engaged member. You're going to feel like you're talking to yourself at first, but that's OK! Nobody likes to be the first person to post on threads, especially in a brand new group, so you have to be your most engaged member to get and keep the conversation flowing! 6 - Welcome new members. Use the built-in feature inside your group for a one-click way to create a "welcome" post. Try to do this often, as using this tool tags the new members. This is a great way for you to welcome them to the group, mention the rules, and share any important and/or timely information with them. 7 - Share your content + other relevant content. Remember the reason for your group - it's not about YOU, it's about your community. While it's perfectly acceptable (and expected!) for you to share your own content in the group, be sure you're also sharing relevant content from other people in your industry. You'll be seen as a trusted resource, and your community, and your peers, will thank you! Talk to your community often! Going live inside your Facebook group allows you to answer questions, share exciting news, teach, and inspire in a fun and engaging way. Scared of the tech or not sure what to talk about? Don't miss Facebook Live 101, the new course from Wit + Wisdom! 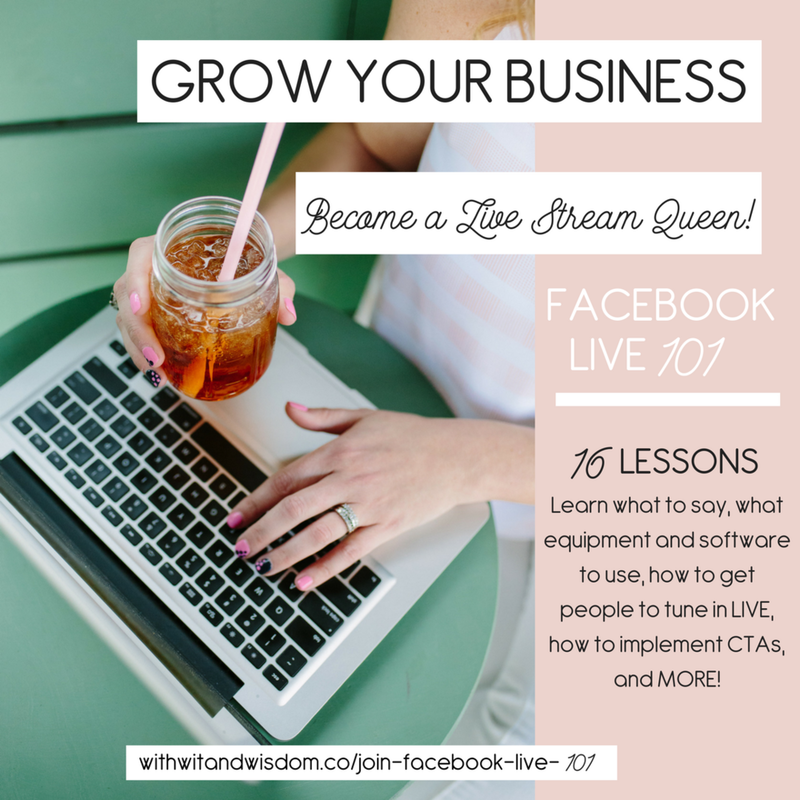 With 16 video lessons + action steps to help you implement what you learn, you'll be the Queen of Facebook Live in no time!